We are approaching Holy Week and if you were interested in worshipping on site, here is the list of services in the Chapel. All are welcome. It is a good idea to try and keep the Three Great Days (Maundy Thursday, Good Friday and Easter Day) as a unity. Together they unlock what lies at the heart of the Christian faith – the passion, death and resurrection of Jesus Christ. Celebrations, Walk at 1pm and Fun Activities for All Ages. St Francis College @ Old Bishopsbourne (233 Milton Rd, Milton) 1am - 2pm. Join us on Thursday 23 May for our next Research Seminar. Presenters will be announced soon. Who: Are you a young(ish) Anglican Church leader? Interested in finding out more about Aboriginal and Torres Strait Islander perspectives on theology, ministry and society? Where: Travel on pilgrimage to Wontulp-Bi-Buya College, Cairns, to participate in the Theology teaching block. This pilgrimage offers theological students and ordinands the opportunity to listen to Aboriginal and Torres Strait Islander theological and social perspectives, and to learn from these to gain a more holistic Australian theological perspective on theology and ministry. Cost: $1,200 per person – includes 7 nights accommodation (single room in a share house), all meals and transport. Please make contact if you are travelling with your spouse. Flights are to be organised by individual. Very limited spaces so get in quick. Download a pdf pilgrimage application form from https://www.abmission.org/data/Get_Involved/2019/WBB_Pilgrimage_Application.pdf. Come and join us for wine and cheese (7-7:30pm) followed by a public lecture by David Clough on The Challenges of Christian Animal Ethics (7:30-8:30pm). Question time will follow the lecture (8:30-9pm). David is Professor of Theological Ethics in the Department of Theology and Religious Studies at the University of Chester and a preacher. He is also the founder and a co-director of the ‘CreatureKind’ project which focuses on the welfare of farmed animals as a faith issue. He is the author of a number of books on animal rights and in particular the use of animals for food including his two-volume monograph entitled On Animals Volume 1, Systematic Theology (2011) and On Animals Volume 2, Systematic Theology (2018). He was also co-editor of the collection of essays Creaturely Theology: on God, Humans and other animals (2009). He has written articles on the ethics of the use of animals for food, including Consuming Animal Creatures: The Christian Ethics of Eating Animals (2016) published in Studies in Christian Ethics. Clough has given a number of keynote speeches, including at the Sarx Creature Conference in March 2017 and has been a participant in many public debates including a debate with Peter Singer on the theology and ethics of the treatment of non-human animals. 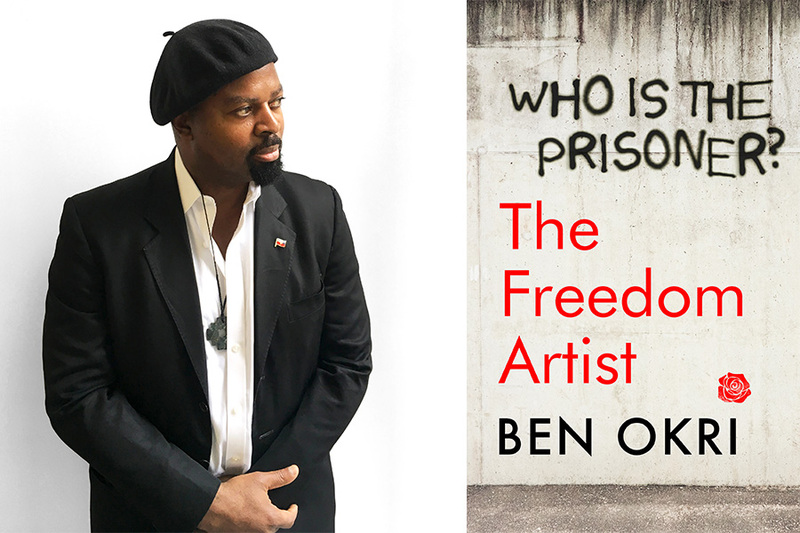 On Tuesday, 11 June at 5:30pm, join us for a book chat exploring Term 2's book, The Freedom Artist by Ben Okri. "In a world uncomfortably like our own, a young woman called Amalantis is arrested for asking a question. Her question is this: Who is the Prisoner? When Amalantis disappears, her lover Karnak goes looking for her. He searches desperately at first, then with a growing realization. To find Amalantis, he must first understand the meaning of her question. Karnak's search leads him into a terrifying world of lies, oppression and fear at the heart of which lies the Prison . Then Karnak discovers that he is not the only one looking for the truth. The Freedom Artist is an impassioned plea for justice and a penetrating examination of how freedom is threatened in a post-truth society. In Ben Okri's most significant novel since the Booker Prize-winning The Famished Road , he delivers a powerful and haunting call to arms." Calling out for all those in grades 10 - 12 to come along to Senior Ichthus 2019! As always, we have a fantastic week planned filled with awesome community, activities and talks to ponder your faith on. Register at www.aycf.org.au for only $275. Come and join us for wine and cheese followed by a public lecture by Prof. John Walton on The Book of Job. John Walton is a Professor of Old Testament at Wheaton College in Illinois and an editor and writer of Old Testament comparative studies and commentaries. Throughout his research, Walton has focused his attention on comparing the culture and literature of the Bible and the ancient Near East. He has published dozens of books, articles and translations, both as writer and editor. This event is sponsored by The Mathew Hale Library. Save the Date! Youth Ministry Guru Andrew Root will be giving a series of public lectures, to which you are invited. Join us for wine and cheese before the lecture on Saturday evening. Andrew (Ph.D., Princeton Theological Seminary) is the Carrie Olson Baalson professor of youth and family ministry at Luther Seminary in St. Paul, Minnesota. A former Young Life staff worker, he has served in churches and social service agencies as a youth outreach associate and a gang prevention counsellor. He writes and researches in areas of theology and youth ministry. His most recent books are The Pastor in A Secular Age (Baker, 2019), Exploding Stars, Dead Dinosaurs, and Zombies: Youth Ministry in the Age of Science (Fortress Press, 2018), Faith Formation in a Secular Age (Baker, 2017), and The Grace of Dogs (Convergent, 2017). This event is co-hosted with the Uniting Church of Australia. Further details will follow. Join us on Thursday 22 August for our next Research Seminar. Come and join Bishop John Roundhill as he begins a series of walks through the southern region of the Diocese. Join +John at 8:30am on Palm Sunday 14 April for a Holy Communion Service with Palms at Chapel of the Holy Spirit, St Francis College (233 Milton, Rd, Milton) before embarking on the 22km first leg of the walk. At 10.00am the walk will begin to St John's Cathedral to catch the start of the Way of the Cross Service at 11.30am. The walk will then continue to St Peter's, Wynnum (77 Charlotte Street, Wynnum) to arrive in time for 6pm Taize Service. For further information on any of the walk please follow https://johnroundhill.blogspot.com/?fbclid=IwAR3vJnKDy2YU2-qA6i4SANJc9aTHZjR_2yPgOV4Umn-lmZCL5mgCFpxYnAg. +John would love some company for any part the journey. Come hear meteorologist, theologian and writer Dr Mick Pope talk on Love your neighbour: Faith & Climate Change on Friday 5th April 6:30pm at St Francis College, Milton and again on Saturday 6th April 10:00am for Climate Justice & Christian Nonviolent Direct Action. On Tuesday, 19 March at 5:30pm, join us for a book chat exploring Term 1's book, Shell by Kristina Olsson. "A big, bold and hauntingly beautiful story that captures a defining moment in Australia's history. In 1965 as Danish architect Jørn Utzon’s striking vision for the Sydney Opera House transforms the skyline and unleashes a storm of controversy, the shadow of the Vietnam War and a deadly lottery threaten to tear the country apart. Journalist Pearl Keogh, exiled to the women’s pages after being photographed at an anti-war protest, is desperate to find her two missing brothers and save them from the draft. Axel Lindquist, a visionary young glass artist from Sweden, is obsessed with creating a unique work that will do justice to Utzon’s towering masterpiece. And reminds us why taking a side matters." St Francis College holds six research seminars each year. The first of these in 2019 promises to be a fabulous afternoon where three members of our faculty will present research and insights from their recent work. There will be ample time for questions, with discussions likely to be energetic and enlightening. We will be breaking for afternoon tea. Interested? Please mark your calendars and join us! You are invited to the Archbishop’s Launch of the Community of the Way. We will gather in the Chapel of the Holy Spirit for a short service of worship during which the Community members will be commissioned and the wider diocese invited to support them in their commitments. Refreshments will follow the service. The week also sees the beginning of Lent with Ash Wednesday on 6 March. On that day, there will be a Eucharist with Ashing at 12.30pm in the Chapel at St Francis College. You are most welcome to participate. You are invited to a Campfire for Shrove Tuesday, including pancakes and a burning of palms around the campfire. Find us in the College grounds near the Admin Building. to the 2019 Commencement Service including the Recognition of 2018 Graduates. If you are interested in widening your theological knowledge or testing the waters towards further education, you can audit a subject at St. Francis College at a cost of $300 ($100 concession). Auditing is a great way to participate in a subject without the need to complete any assessment items. A book sale for lovers of beautiful books! Earlier this year Peter Mann made a wonderful donation of books to the Roscoe Library. Over 600 titles have already been added to the Roscoe Library collection, but there are several hundred beautiful books for sale. Many of these books are hardbacks with dust covers and in ‘as new’ condition; they would make lovely Christmas presents or excellent holiday reading. Topics include Art, Asian Studies, Biblical Studies, Classic Literature, History, Philosophy, Poetry, Science and Theology. Payment can be via an EFTPOS terminal, or cash will also be acceptable (correct change would be appreciated). Please provide your own bags. Join us for music, reflection, dinner and marshmallows around the campfire. All welcome! On Tuesday, 27 November at 5:30pm, join us for a book chat exploring Term 4's book, Boy Swallows Universe by Trent Dalton. Applications are now open for the first intake for 2019 for Spiritual Direction courses being offered at St Francis College. Two courses are available (Certificate in Spiritual Direction – 4 years part time and The Art of Contemplative Listening – 1 year part time), offering an opportunity to foster and develop a personal stance of deep interior listening to the heartbeat of God within ourselves and others, and to evoke through conversation, a deepening personal and intimate relationship with the Divine. Ever wondered how Christianity became truly global and how Christians have found creative ways to respond to the extraordinary political, social and intellectual changes of the last 300 years? Where do today’s challenges come from, how is this impacting us, and what is God saying afresh through the diverse Christian voices of our world? Come explore ‘Global Christianity since 1700’ together this summer at SFC. Intensive course days 17 & 24 Nov and 2 Feb. Study & audit options available. Contact the College on 35147403 for more information. Have you ever thought about studying Theology? We have the subject for you! This weekend the Chapel of the Holy Spirit and Old Bishopsbourne will be open for viewing by the public from 11 - 4pm daily as part of the Brisbane City Council’s Brisbane Open House initiative. Tours will be held at 1pm, 2pm and 3pm on Saturday and Sunday. Come along and view the beautiful architecture, stunning grounds and gain behind-the-scenes access to these spectacular buildings. What an inspirational and peaceful place to study! St Francis College will also host a BBQ and Drinks stall on the Saturday between 11 and 2pm. All welcome. Meet Areej Masoud, a Palestinian Christian born in Bethlehem. and how you can extend Christ’s love and offer hope. Thursday, 20 September at St Francis College, Milton in Lecture Rm 1, from 2-3pm. Dr. Marie-Louise Craig will be presenting a paper titled "Hebrew-English Lexicography in America prior to 1900." Here is the abstract of her paper: This paper is part of a chapter in a history of Hebrew-English lexicography. The American H-E lexicographers are an interesting study because of their personalities and the politics of publication and scholarship in this field. The paper presents a short biography on each lexicographer, including his interactions with others in the field and an outline of his contribution. Accordance equips you with cutting-edge original language tools, interactive 3D maps, a dynamic interlinear, drag-and-drop graphical searching, and a host of other tools designed to take your Bible study to the next level. All of these tools come packaged in a clean and simple interface that can be customized to complement your Bible study objectives. In conjunction with the forthcoming Abundant Justice & Prophetic Imagination Conference, ABM is joining St John's College, St Francis College, the Public Affairs Commission, and the Social Responsibilities Committee of the Anglican Church Southern Queensland, to run a day for Young Anglicans (aged 18-40)* from around the Australian church. *If you are 17 and would like to attend the conference please email missioner@abm.asn.au to obtain an application form which includes parent consent form. For further information, and to register, visit the Abundant Justice website. You’re invited to join with us as we discuss our book for Term 2 2018, The Immortalists by Chloe Benjamin. Rosemary Gardiner will facilitate our discussion. St Francis College will host a three day symposium gathering artists, theologians, and philosophers to reflect on the relationship between theology and art. Art here is to be conceived in broad terms; from classical to contemporary, from high to low. There will be art installations, poetry reading, and musical performance. At 7pm on 14 June, St Francis will host a free public lecture given by the renowned Australian poet, philosopher, and theologian Kevin Hart. Described as the "most outstanding Australian poet of his generation" and "one of the major living poets in the English language," Hart has published several volumes of poetry that sit alongside his works of theology and philosophy. Most recently, he has published a book that unites all three areas of his work, titled: Poetry and Revelation: For a Phenomenology of Religious Poetry. Kevin's lecture will be titled Contemplation and Fascination. The lecture is free and open to the public and will be held in Lecture Rm 1 on St Francis' campus. In 2016 the Diocese formally committed itself to a three year Reconciliation Action Plan (RAP) to move forward our commitment to Reconciliation. As this year’s Reconciliation Week approaches, all members of the Diocesan family are encouraged to renew our commitments to our shared Reconciliation Plan, through participation, prayer and action. National Reconciliation Week is 27 May - 3 June. You are warmly invited to join the St Francis College community for their Reconciliation Week Eucharist at 12:30 pm on Tuesday, 29 May. The 2018 Felix Arnott Lecture, For God’s Sake: The Wall of Hostility has come down, will be given by Professor Ellen T. Charry on Monday 7 May beginning at 7pm. Her lecture will explore a thorough reconstruction of the theological relationship between Judaism and Christianity. Please note that the venue for this year's Felix Arnott Lecture is the beautiful heritage-listed Christ Church, Milton. There will be free and plentiful parking available. From Castlemaine St, turn into Chippendall St. Once in Chippendall St, parking will be the first turn to the right (where the buses usually park for Suncorp Stadium events). After the 12:30pm Eucharist, a member of staff will lead a discussion around the readings for the following Sunday. We'll meet in the Common Room (under Lecture Room 2). You’re invited to bring your lunch and to join the conversation! After the 12:30pm Eucharist, a member of staff will lead a discussion around the readings for the following Sunday. You’re invited to bring your lunch and to join the conversation! In 1995, A Prayer Book for Australia (APBA) was the first revision of an Anglican Prayer Book in the twentieth century (revising An Australian Prayer Book of 1978). Now, the Anglican Church of Australia is the last of all the churches in global western Anglicanism to revise its liturgical resources. The pioneer has become stuck. Persons involved in the processes have been candid about the difficulties of both APBA's production and its initial reception--and those difficulties had longstanding precedents in historic polarisations in Australian Anglicanism. But these have intensified since 1995 such that, for a variety of reasons, common prayer no longer exists. At the same time, understanding and practice of common prayer has developed in new ways around the Anglican Communion--not least with a new missional consciousness--leaving Australia missing marks that now characterise wider Anglican worship. Given that, as the Liturgy Committee of the national church acknowledged at the last General Synod, maybe less than half of Australian Anglican churches use APBA, this lecture enquires about the future of sacramental common prayer in Australia, exploring consensus and clues in international Anglicanism that might dodge the diocesanism and factionalism of the Australian situation.